NNEDV’s Capacity Technical Assistance project provides comprehensive, specialized consultation, assistance, and training to coalitions, FVPSA State Administrators, and local programs in order to best address the needs of victims of domestic violence. State and U.S. territorial domestic violence coalitions provide critical leadership in coordinating efforts to end violence against women, addressing systemic barriers facing survivors and their children, and, strengthening domestic violence services. Coalitions have access to technical assistance regarding best practices at the national level. 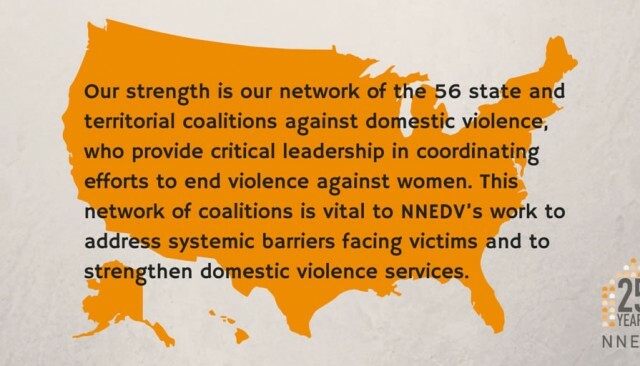 Since its inception in 1990, NNEDV has prioritized enhancing the capacity of coalitions and the roles they play with local domestic violence programs and allied organizations. Regional Meetings to reduce isolation and share strategies for addressing issues specific to coalitions and local programs in each NNEDV region. Resources and publications including, an annual directory of U.S. coalition staff and programming. NNEDV’s work with coalitions is funded by the U.S. Department of Justice’s Office on Violence Against Women (OVW) and the U.S. Department of Health and Human Services (HHS), Administration for Children & Families Family Violence Prevention & Services Program (FVPSA), and by private donors. Read more about the variety of technical assistance NNEDV provides for OVW grantees. NNEDV’s Capacity Technical Assistance project, in partnership with the Resource Sharing Project (RSP), created this interactive e-Learning course, to help bolster your work either on or with a non-profit board of directors. This online board orientation program works to provide fundamental training tools for coalitions and local programs to implement with board members, executive directors, and agency staff. This program was designed to be self-guided and highly accessible. The modules can be accessed individually and out of sequence, so as to allow users to modify and tailor the presentation to fit coherently and cleanly to your own specific organization and needs.